An article on Ham Universe describes a 10 Meter Dipole Project Using The Velocity Factor of Coaxial Cable To Reduce the Size Of Antennase attributed to PY2RML. This antenna is sometimes (though probably incorrectly) called a coaxial dipole or coax dipole. The article describes a centre fed dipole that uses coaxial cable for each of the legs, and the coaxial cable sections have a s/c at the outboard end, and the antenna feed is connected to the inner ends of the inner conductor. The inner ends of the outer conductor are not connected, and so the coaxial sections act as a pair of s/c stubs in series between the feed point and the dipole centre. "I had a perfect match with my RG58 cable to the rig. It was a 1: 1.1 SWR in the first test mounted up about 13 feet." The article attempts to explain the operation of the antenna as shortened due to the velocity factor of the cable, and proceeds to use 0.66 as the velocity factor of the RG58 foam. Velocity factor of foam dielectric is usually higher that that of solid polythene by virtue of the gas inclusions, and velocity factor around 0.8 is more common. The way in which velocity factor is held to explain the shortening is quite wrong, the coax sections act as s/c stubs, which load the antenna with series reactance that depends on Zo and their electrical length. Nevertheless, this article uses the formulae as stated using the 0.66 factor. An NEC model was constructed using LMR-195 foam coax (dimensionally equivalent to RG58) for both the stubs and a 25m feedline. The model assumes an effective balun, ie that there is no common mode current on the feedline, though the article does not show or mention a balun. Models were constructed for the 10m example, and a 40m design to test the suggested application to the lower bands. The models to not address radiation pattern, but focus on the VSWR claims and make an estimate the system efficiency. The design for 10m was copied literally. 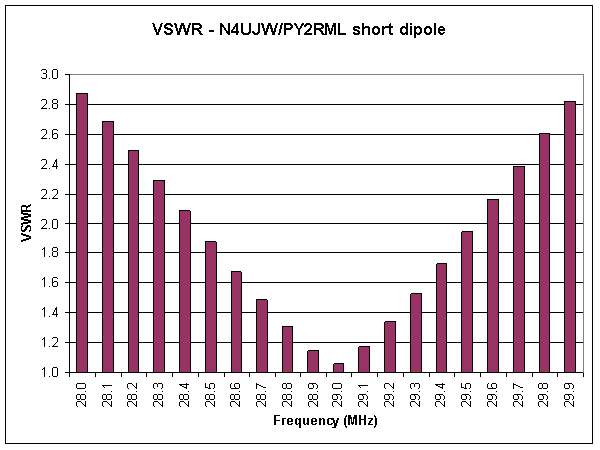 Fig 1 shows the modelled VSWR at the source end of the feedline across the 10m band. It is certainly a very good match in the centre of the band. Radiator: copper loss in the outer surface of the radiator stubs. Losses in the stubs are significant, and greater than loss in 25m of feedline at the centre frequency. A question for the end user is whether 4dB system loss is acceptable for the benefits obtained. An NEC model was constructed using the design formulae and the dipole located at 10m over average ground. 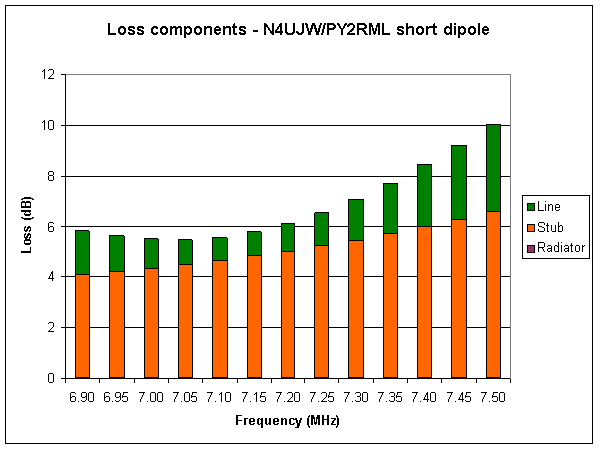 Resonance was well off prediction, so the length of the dipole legs was increased by about 4% to locate resonance at about 7.1MHz. Fig 3 shows the modelled VSWR at the source end of the feedline across the 10m band. 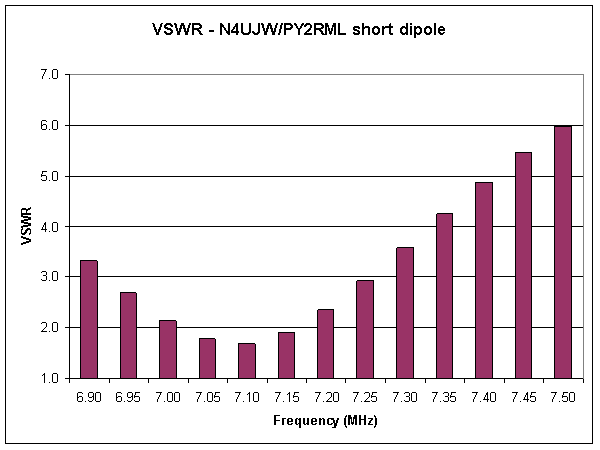 VSWR at resonance at 1.7 was not as good as the 10m case. Fig 4 shows the losses again in three categories. 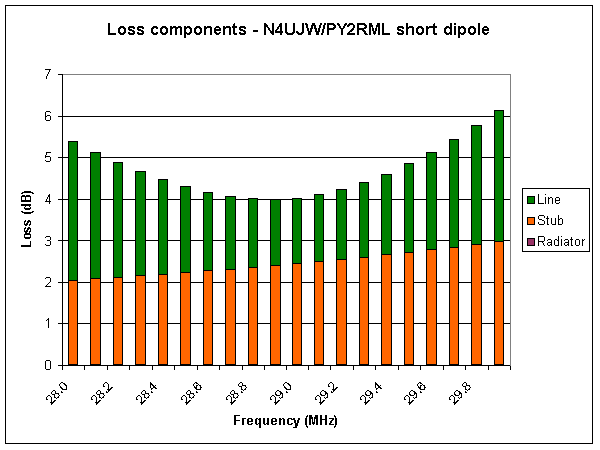 Stub losses are quite high at almost 5dB at centre frequency, total loss 5.6dB for a system efficiency of 28%... a very high price for mediocre VSWR and about 30% reduction in length. A question for the end user is whether 5.5dB system loss is acceptable for the benefits obtained. Curiously, all these are Ham Universe articles, and endorsed by Ham Universe / N4UJW. a system view provides a more complete picture of performance . V1.01 22/03/09 17:34:03 -0700 .